In the continued absence of any building related news to discuss this week, and while recovering from A) the monster big blow storm thing on Monday, and B) the gorgeous full-on summer of the last two days, all I can think about is that I’m glad I’m not in Auckland right now. There is the whole shoddy sordid affair of Len Brown going on in the media, with Cameron Slater now trying to portray himself as the angelic, virtuous one, Mayor Brown as the powerful overlord, and the young woman as – well, actually, I really don’t care what Slater thinks, nor what Brown has done, nor who or what she is or was. Human beings have affairs, and all that really matters is: does it affect how he runs the country’s biggest city? I think not. Brown is an odd fish anyway, with his continued propensity to burst into song, which is normally confined to those doing welcoming speeches on Marae, or those spending boozy late nights in tacky Korean karaoke bars. Bill Clinton was, in many ways, the best President that the US had for years, but as the moral leader of the country, he was undone by the Lewinski scandal, and I’m surprised that the Cuban cigar business ever recovered. But Brown does not need to have quite the same lead on morals, and hopefully will survive this storm of moral outrage, manufactured by a man with no great morals himself. All that matters, is that Auckland continues to have a leader who has the vision to understand that a decent Public Transit system is installed, linking up our biggest city so that it is not entirely reliant on cars. Speaking of moral decadence, brings me right on to John Banks, currently, and for some time, holder of the title of New Zealand’s Slimiest politician. His continued ability to brazenly lie to the public, to lie to parliament, and to lie to the judiciary just amazes me. It is appalling to think that he once was the Mayor of Auckland, and I’m glad that Auckland realized some time ago that he was not to be trusted. His whole existence in parliament is a sham, being head of a discredited party, and when he goes out at the next election (as he surely must – even the people of Epsom must have some moral bottom-line), then hopefully the whole sorry sordid saga of ACT will hopefully go with him. Act no more, little John. But the really big Shoddy news this week has to be the state of the scaffolding on that building in Willis Street. We seem to have dodged a bullet there, by the simple means of the scaffolding falling inwards onto the site, rather than outwards into the street. If the scaffolding had collapsed outward, across busy Willis St, in those stormy weather conditions, we could have had many deaths. We are incredibly lucky, once more. But New Zealand can’t keep relying on luck. We have had 2 decent earthquakes here in the last few months, and come through them, by luck, with almost no damage. Yes, I know that we have buildings built to a substantially higher standard than they did in Christchurch, and so, yes, our modern buildings quite rightly shrugged off those earth tremors with zero damage. But we all know that there are still many buildings in Wellington that we need to find the means to strengthen, rather than wait for the big one, or to argue that demolition is our only answer. Let’s hope that Wellington’s new Council has the ability to make decisions to strengthen our city. Now. Max – have you seen this? Seems to put it all into words quite well…. Speaking of buildings struggling to find the means to strengthen, there is speculation that this is part of the cause behind the very recent demise of The Empire theatre in Island Bay. Here’s something fishy you may want to cast your eye on. I haven’t had time to hear it myself, but from what I have been told about it, it goes some way to explain why building here is so expensive. And it fits with a story I heard about somebody importing all their building materials from Europe and saving a huge chunk of money when building of their house. diessoli: not surprised in the least. While the usual suspects in Govt are obsessed with building fatter and ‘bureaucracy gone mad’, they’re conveniently ignorant of the cartelised building materials industry. Would be even less surprised if said usual suspects are in the industry’s pocket. To add, it’s cheaper to build in Australia despite them having a stronger trade union movement. Seamonkey: And idea if Aussie earthquake codes are less tight than NZ’s, given they’re much further away from major faultlines? deepred: no idea, but would hazard a guess yes, they wouldn’t be. Although a Googol seems to suggest that they are currently reviewing them. …and so it goes on. The cost of framing timber here when we grow so much of the stuff is crazy. 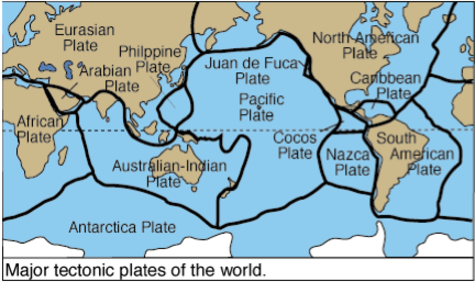 This shows the plates – Aussies are all of a piece whereas we are sliding past each other – that is why they are home to some of the world’s oldest rock above water and we are fresh out of the bath. The jack-up in market prices is because we are a small market – like Sky with tv and cable, Fletchers have large vertical integration from quarry to concrete truck; from timber to truss manufacturer, etc. The other reason for prices is the lack of standardisation – in the UK you’ll have maybe 40 subtrades building a house eg one guy will install kitchen vent exhausts all day everyday. Here we don’t have Coro St type common design houses and typically you’ll have a builder, concrete slab install company, plumber, sparky and roofer with joinery brought in. While I’m at it, avoid this new push for steel frame houses – they are shite. Slam the front door and you hear it in the back bedroom; steel frames belong on commercial office and shop divider walls only. I note that BRANZ pulled an unwanted classroom apart out in Carterton recently and the timberframe structure stood up to the forces much better than expected. The way to drop prices is in the design phase to make houses based around a bunch of standardised wall units that can fit inside a shipping container and bring boxes in from China. If the relevant authorities can be satisfied that the treatment to the timber units is ok then “lego” houses will get you around the rapacious local prices. Wellington doesn’t have substantially stronger buildings, just a couple of largish earthquakes 50 to 60 km away. Further away than the 2010 Darfield 7.1 was from Christchurch. And, Wellington lost masonry on Featherston Street buildings, and parts of the port are severely damaged. Nothing has been learned. Complacency rules.